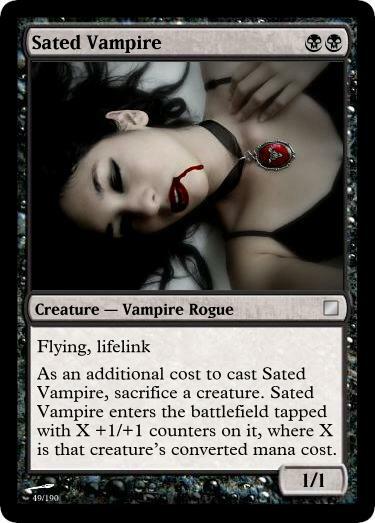 3/28/2011 - Sated Vampire uses a devour-like mechanic but makes the sacrifice a required cost. How does that affect the balance of the card? On turn two, the best you can have is a 2/2 lifelink flyer, which seems pretty fair. I think you'll mostly want to play her later and sacrifice something that wants to be sacrificed or is no longer relevant because of a Pacifism or such. If the player does intend to play Sated Vampire later, we should consider just making her bigger and more expensive so you can get more value out of your turn and so that the card is less confusing to inexperienced players. I, for one, love the Serra Avengers of the world because I enjoy the tempo or aggro-control strategies that they make possible. I'd make it an optional ETB trigger so it doesn't have to sit in your hand if there's nothing to eat. Also, I feel like X should be toughness instead of CMC for the sake of resonance. Yeah, I'm assuming the CMC clause was there due to concerns regarding the consumption of big-booty walls and the like, except that's not typically a role for monoblack cards. And even if it were, let people live that dream. After all, devour effects aren't aimed towards Spike/constructed, as it's inherently card disadvantage. IF one were to go the toughness rather than CMC route, I'd be dreaming of combining this with a bigass Ajani-spawned avatar token in an Orzhov deck, or some suicide Black shenanigans with this, life-for-card draw engines and Death's Shadow. Fun!